With a little help from Photoshop I’ve created a storyline which I feel quite strongly about. But does it work? Does the content come together and have I succeeded in what I want to express? The mosaic is made up of multiple shots of baboons raiding refuse bins, although over the past few years great strides have been made here in the Cape Peninsula in tighening up on bin management. But it’s not just a local issue, perhaps we could all do our bit by not littering or leaving unsecured household waste in areas where wild creatures roam. I love your centerpiece and story and commend you for your conservation efforts. i also think your creative mosaic is a great medium for this message, especially if it is presented in a large format (e.g. a wall poster). When viewed full size on my laptop screen, I have trouble interpreting the small thumbnails and would find it more effective if you used fewer/larger images for your backdrop? Thanks for the feedback and helpful comments, Nick. It was a bit hit and miss setting up the dimensions for the droplets used in the mosaic. Will have a play with that and see what kind of results I get rescaling. I think your concept is great but without reading your explanation I wouldn’t have realized. Even making the photo as large as I can I couldn’t really see many of the tiny images. I don’t live anywhere near baboons so didn’t know unsecured rubbish bins were a big problem. I really like what you’re trying to do. I agree with macmsue; without the explanation I wouldn’t have known. I have blown it up as far as I could; it’s hard to make out the tiny images in the background. I think they have to be twice the size? Thanks Dina, it’s always good to get your comments 🙂 The feedback from everybody is really helpful, as the story really lies in those thumbnails. Am going to have a go at rescaling so that they ‘pop’. Thanks for your comments, Sue. It’s helpful to know how the images ‘read’. I have a better idea now on how to approach setting up the mosaic layer. I quite enjoyed the process, and will try it out in a bigger format. I guess a good caption at the bottom would also help with the context. You’ve expressed yourself admirably! This post’s message reminds me of the growing problem here of black bears raiding trash bins and the education that goes into teaching folks to make their trash unattainable. Thanks, Eliza. Securing trash seems a growing problem worldwide. Getting people to act responsibly is another! The urban/ wildlife conflict is a whole growing subject. Agreed, a monumental problem that must be addressed. As Nick commented, this would make an excellent educational poster, but maybe with slightly larger background images? Thanks, Jude. I’m glad to get the feedback, it helps to know how to get a better impact. I quite enjoyed the process of putting the mosaic together and have a better idea to tackle the next one. I agree that it is difficult to interpret those small background thumbnails and that rearranging those might be just the ticket to making these layers work very effectively. Thanks, John. It’s been helpful getting feedback…will have a go at rescaling to get those thumbnails to ‘pop’. Great idea, in high resolution like a ‘search image’ on PC, perfect as poster for a wall. Great motivation and idea, but I agree that fewer, larger background pics will do the trick. Hi Melanie, thanks for the comments… I’m going to have another go at rescaling the mosaic layer. That’s the content which needs to ‘pop’! I love it! The baboons look marooned on a tiny island of green, surrounded by a sea of junk. I agree with other commenters that the thumbnail images are indistinct, but to my blurry eyes they look like rubbish, – which works! I think if it was blown up to poster size the message would be even clearer. It’s an excellent concept. Would also be interested in seeing the next version using fewer, larger background images. Thanks Sandy … Great to get the constructive feedback. The mosaic layer is the stuff with the ‘goods’. I’m going to rescale, see how it comes out. I think this is brilliant and would be good poster size in some community area,to illustrate the point. Well done with the layering, i haven’t a clue how to use them! Thanks Gilly, I’m learning that working in layers can be quite creative :). It’s been helpful getting feedback to know how it impacts. Thanks Spokie… It was quite a process, thinking of other possibilities now. Add me to the poster proponents Liz. Your large shot is beautiful and your message comes thru loud and clear. Well done as always! My first impression was- “This is a great concept!” My next action was to enlarge the photo because the icons were not initially clear (although your explanation provided a key clue). Then, my thoughts were exactly what I see others have suggested… use fewer icons that are a bit larger. YES! This would make a terrific avenue for an education-oriented campaign poster- or an info graphic. Very creative, and a project worth further development. How right you are about humans and their waste! The problem a few blocks north of where we live in North Vancouver are bears who, like baboons, are highly intelligent and opportunistic animals that will raid any garbage bin that is not perfectly secured. Our children have had several bear alerts at their school over the past few years, in fact. Oh, and great photos, BTW! How common it is world wide … foxes in London, raccoons in Toronto, wild boar in Europe … and so it goes. Although must say that would rather have to deal with baboons than bears – quite a different challenge. My aged eyesight doesn’t play nicely with this mosaic approach. Sorry! As for the difficulties in mixing the wild and domestic inhabitants of areas — here in a very suburban-rural small town (but not so very small) — we have bears coming around for birdseed (people WILL feed the birds although there’s plenty for them and the bears just take down the feeders anyway). And being sloppy about putting out the garbage — that’s a real No No! We have black bears, not usually really dangerous, but they’re wild creatures nonetheless! It’s amazing how some people seem to think they’ll make them occasional pets! Thanks for your comments, Judith. I appreciate the feedback. 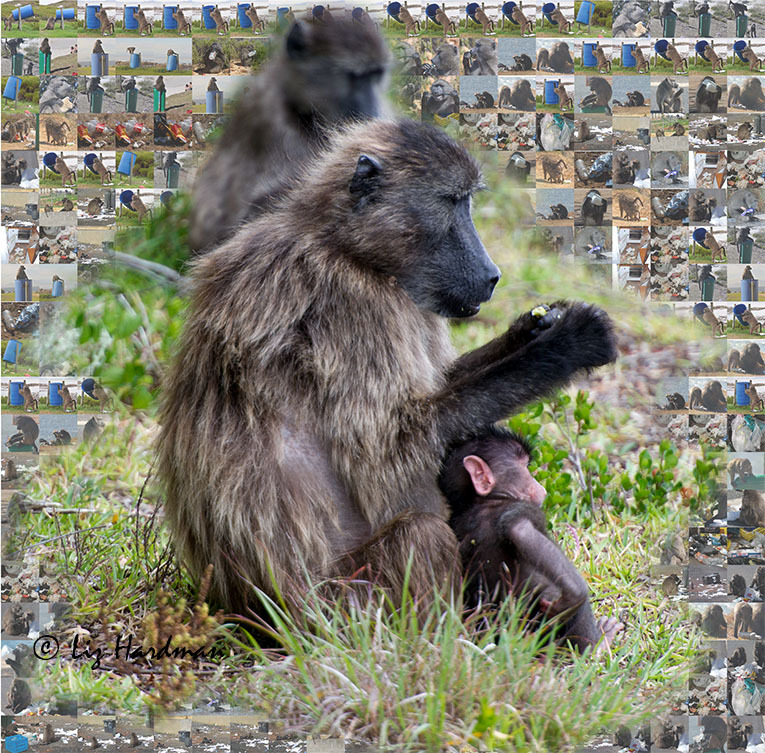 Initially I thought of setting up an image using just the outline of the baboon and filling it with a layer of trash. Just need a bit of time to have another play at it. But I get it that the mosaic images are too small and fussy – and need adjusting. It surprises me how far spread the distribution of black bears is in the States and how often they encroach into urban areas – even swimming across bays. Darn, it’s sad though that the animals are penalised when it’s us humans who fail to be consistent and sloppy in our approach to managing our space. It’s curious how humans want to tame the wild, or think that it benefits the animal to feed them! I spent a lot of time in my neighbourhood raising baboon conservation awareness – doing pamphlet drops, getting trash bins baboon-proofed, doing lectures at the schools, but there will always be those who really couldn’t care less. Sad!